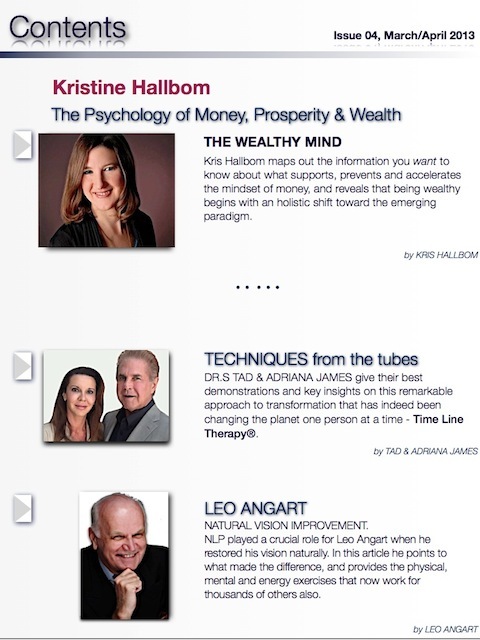 * KRIS HALLBOM – gives us a Wealthy Mind Profile and lays out what it takes to bring about holistic wealth from the inside out. More often than not, if something is holding you back, it’s probably right under your nose- things get to stay ‘unconscious’! * NICK KEMP – In the spirit of preserving and maintaining professionalism in the NLP field, Nick outlines the bricks and mortar needed to create a solid footing as we reach toward quality validation and recognition. * LEO ANGART – Leo sees things more clearly now than ever, and he’s helping others do the ‘impossible’ because of it. 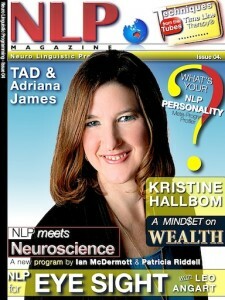 NATURAL VISION IMPROVEMENT with NLP is a reality (and a great metaphor) – will you make it yours? 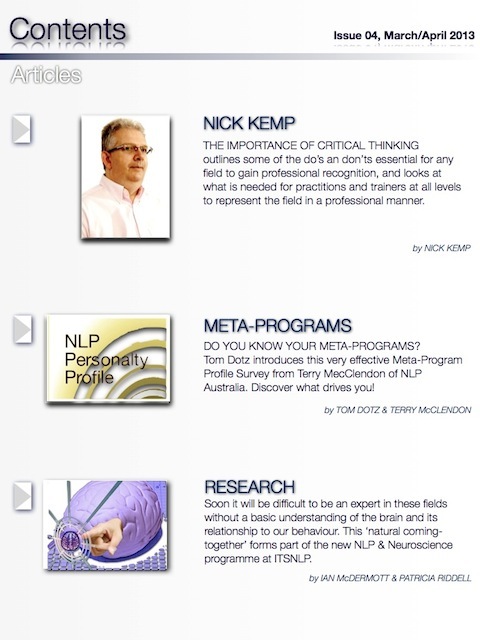 * THE PERSONALITY PROFILE of NLP – Tom Dotz and Terry McClendon join forces to deliver you a first-hand experience of Meta-Programs. Sameness/difference, Internal/external, Toward/away – these are at the core of who we are. Have you met yourself yet? Go ahead and take your FREE survey. * NLP RESEARCH: NEUROSCIENCE meets NLP – Ian McDermott and Patricia Riddell are creating a natural coming-together of brain science and the best of NLP. Enquire about a Volume Purchase for your organisation.